The beautiful and peaceful Kingdom of Tabor is ruled by King Magnus (Noah Huntley) and his Queen Eleanor (Liberty Ross). Queen Eleanor gives birth to their daughter Snow White and she is loved by the entire kingdom – for her beauty and kindness. The Queen dies when Snow White is a little girl. The King rescues a woman from the Dark Army – Ravenna (Charlize Theron). He falls in love and marries her quickly. On her wedding night, Ravenna kills the King and seizes control over the Tabor. Snow White’s childhood friend William tries to save her but it is too late – she is taken captive and he and his father are barely able to escape. Ravenna, a powerful sorceress now rules the Kingdom with her brother Finn (Sam Spruell) as her righthand man. Snow White is locked away for many years, until the Queen’s Magic Mirror tells her that if she takes Snow White’s soul she will become immortal and Ravenna decides to kill her. Snow White breaks away from Finn and escapes into the Dark Forest, and Ravenna is furious with Finn and orders him to find her immediately. 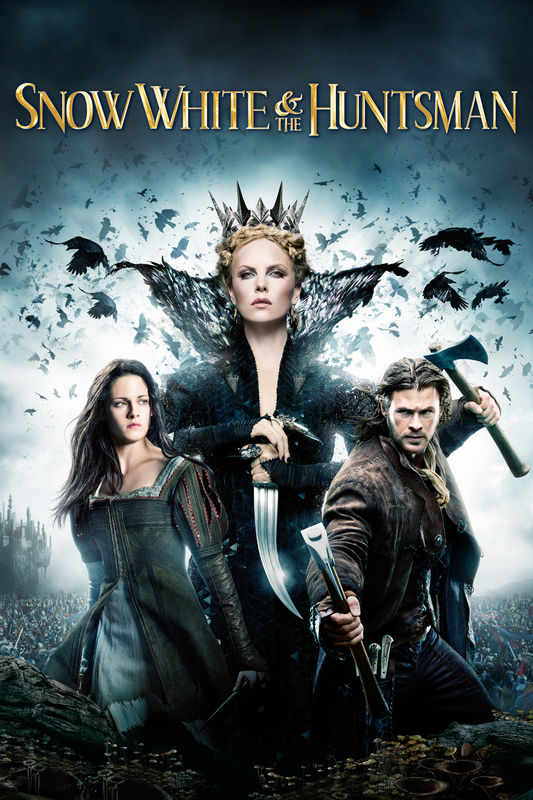 Because Ravenna has no power in the Dark Forest, they need the help of someone else and they decide on Eric the Huntsman (Chris Hemsworth), a drunkard who is still grieving the death of his wife. Ravenna promises to bring his wife back from the dead and only then he agrees. Meanwhile, news that Snow White is alive reaches the Duke and his son William (Sam Claflin), and William immediately leaves on his own to go search for her. Eric catches Snow but quickly starts to question why the Queen wants her so bad. He and Snow flee into the forest to escape Finn and find a fishing village where the women disfigure themselves to not be hunted by Ravenna. Eric realises who Snow White really is and decides to leave. The village is attacked by Finn and his soldiers and Eric returns and saves her. they flee firther into the forest. William, who infiltrated Finn’s army in the hope of saving Snow White, sees them dissapear. In the forest they meet the Dwarves, who ties them up. One of the Dwarves, the ancient Muir, senses that Snow White is the daughter of king Magnus and that she can defeat Ravenna, and they head into a fairy sanctuary. In the fairy Sanctuary one of the dwarves is killed when he jumps in front of an arrow to save Snow White. William finally joins the party and they head to Duke Hammond’s castle. On the way there, Ravenna disguises herself as William and tricks Snow into eating a poisoned apple. Desperately, William kisses Snow in the hopes of awakening her but it doesn’t work, and they take her to the Castle where she lies in sleep. Heartbroken Eric tells her his story and finally kisses her, and she awakens. Snow rallies the Duke’s Army and they head to fight Ravenna. Will the army be able to kill Ravenna? Will the Kingdom become whole again? I enjoyed the new take on the classic fairytale. It is a lot more girl power than the Disney version, and both female leads were strongly written. 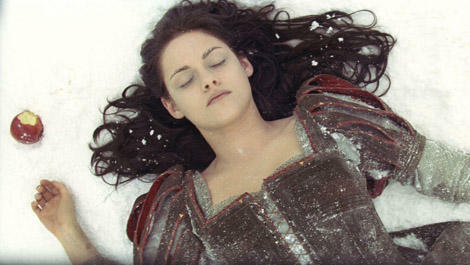 I’m sure that there were loads of better actresses that could have portrayed Snow White better than Kristen Stewart. In Snow White and the Huntsman her acting is remarkably better than in all the Twilight movies, but she still leaves me unmoved. The speech after Snow White wakes up is very uninspiring. I would not be motivated by the screeching sound that emits from Kristen Stewart when she needs to make an impassioned speech. Once again she only manages to look constipated. Now, my bestie is likely to tell you that I have a tendency to gush about Chris Hemsworth – no idea WHAT she is talking about – but OMFG he is damn hot. 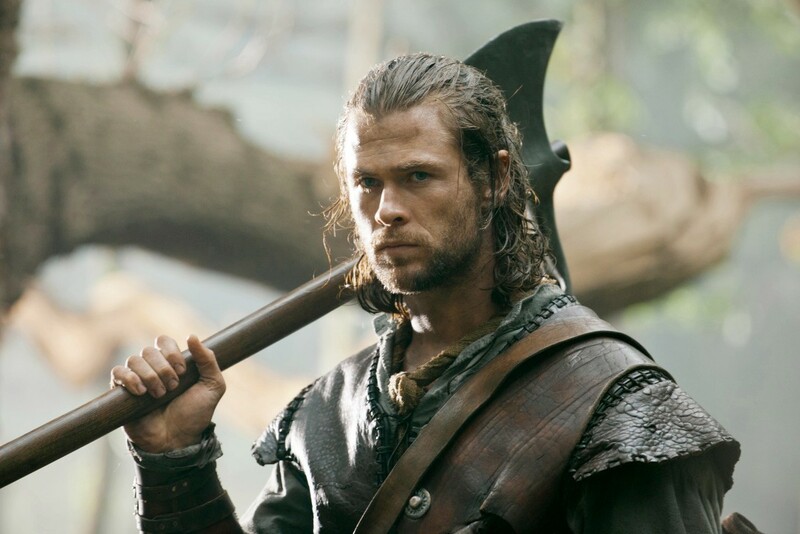 In Snow White and the Huntsman it was pretty much the voice above all else – not discounting how he rocks the dirty man look – but suddenly I am really appreciating the generally annoying Aussie accent. Back to his acting: I thought it was decent. As mentioned before, he delivers better acting than what would be his typecast performances. Let’s take another Twilight alumni for example – Kellan Lutz, who is fine to look at and good at throwing things around but not much else. I also thought Sam Claflin fits perfectly into the fairytale prince. I felt genuinely sorry that he didn’t get the girl, but Eric was a much better match for Snow. The storyline did seem a bit unclear at times, and does drag some. It is filmed in the dark fairy-tale mood that is so popular right now and works relatively well. I liked the how disgusting the dark forest was and also how beautiful the Fairy sanctuary (or whatever) was. The dwarves were cute. The furry apple still makes me feel slightly sick. It still does. I really liked how the mirror was portrayed. 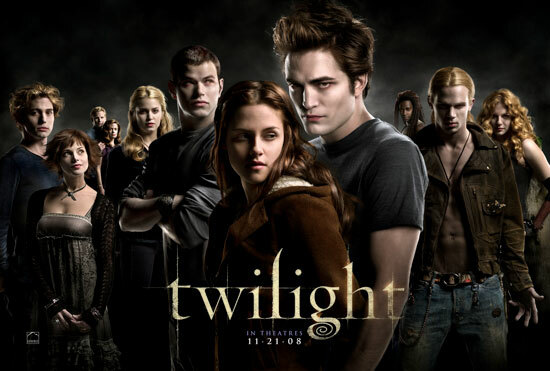 Based on the worldwide success of the Twilight series, written by Stephanie Meyer, Twilight tells the tale of how a human girl fell for a vampire and their journey together. Bella (Kristen Stewart) moves to the Forks, a place where it rains almost nonstop. Although not excited about leaving sunshine behind, she chooses to go live with her father to give her newly wed and scatter-brained mother space with her new husband. Bella is instantaneously a hot property in Forks. The guys want to date her; the girls want to be her. Mike Newton (Michael Welsh) is leading the pack of eager boys, making no secret that he would like to date her. It threatens to become awkward when Bella realises her new friend Jessica Stanley (Anna Kendrick) is interested in Mike. Bella manages to dodge a bullet by telling Mike to take Jessica to the dance, because she doesn’t plan to go herself. Bella notices Edward Cullen (Robert Pattinson) during lunch on her first day. Edward and his siblings possess an unworldly beauty, and she is struck with their magnificence. Jessica, who notices Bella staring, quickly points out that no one in Forks is good enough for the Cullens, leaving the thought that she would have loved the attention by them. Even though he is far away, Edward smiles as if he heard her. Later on in Biology, Bella sits next to Edward, but his animosity shocks her. She feels the anger he feels for her, but has no idea what she could have done to evoke it. He rushes from the class immediately when the bell rings, and she finds him requesting to be transferred to another class. She is stung by his open hatred, and when he disappears for a few days she is certain that she is the reason. Edward returns suddenly to school one day, and seems perfectly polite. They manage to have a few conversations, but he constantly leaves hints he may be dangerous. In the school parking lot Bella nearly dies when Tyler Crowley loses control over his car, but Edward moves at a superhuman speed to save her, and shields her body from the collision with his own, carrying no scars from it. At the hospital, they have a fight when he still refuses to tell her anything. 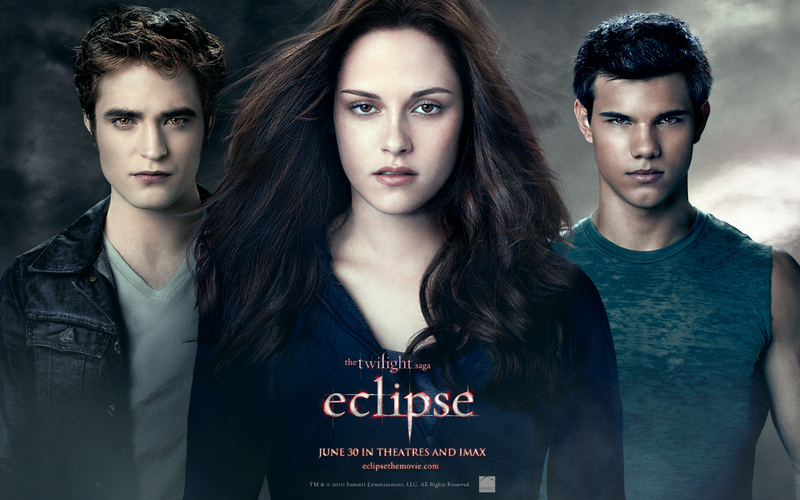 Bella invites Edward to join her friends on La Push, a beach on the Quileute reservation in Forks. He declines, stating he isn’t welcome there, and Bella thinks it may be because of Mike’s crush on her. While there, Bella talks to an old friend Jacob Black (Taylor Lautner), who is part of the Quileute tribe. After a cryptic comment from another Quileute, Sam, Jacob tells Bella the legend about the Quileutes, who turned into wolves to protect their tribe from the cold ones, whom Edward and his family is a part of. Because the Cullens differed from the usual Cold Ones, a pact was made between the groups. Despite the truce, the Cullens are still regarded as a threat by the Quilettes, and they are not allowed on the reservation. Bella looks up the new information from Jacob on the internet, and find references to the cold ones as well as vampires. She goes with Jessica and Angela (Christian Seratos) to another town under the guise of finding dresses for the two girls who are going to the prom, but so that she can visit a bookshop that has a book about vampires. After buying the book, Edward saves Bella from being attacked by a group of young men. How he knows where to find her is still a secret, but she is nonetheless thankful. He takes her to dinner there and causes the speculation of Angela and Jessica who was desperately worried. Back in Forks Bella researches further on vampires, and reach the conclusion that Edward and his family are indeed blood sucking monsters. She confronts him, and he confirms her suspicions. On her question about his diet, he tells her that they live off animal blood, backing Jacob’s statement that their family are different from other vampires. Edward tells Bella that his animosity towards her in the beginning was because her blood smells so potent to him, and he struggled not to attack her. He also confides that some vampires have special gifts, and that he has the ability to read people’s minds – except hers, and that she is the first person ever whose mind is shielded from his abilities. He is especially dangerous to her, and yet they start a relationship. It has more problems that most – they are effectively different species, he is so much stronger than her than the norm, and he desperately yearns for her blood. Their relationship is tentative and sweet and controlled. She meets his family – his “father” Carlisle (Peter Facinelli), whose greatest gift is his compassion, his sweet natured “mother” Esme (Elizabeth Reaser), who is a mother figure to everyone, Alice (Ashley Greene), who sees the future, Jasper (Jackson Rathbone), who has the ability to control emotions, Emmet (Kellan Lutz), a big, brawny vampire who has a funny nature, and the beautiful Rosalie (Nikki Reed) who despises Bella because of the danger she poses to the Cullens. Bella joins the Cullens on her first official outing with them. They use times when there is thunder to play baseball – the only time where it is okay for them to make so much noise. It goes well, until another bunch of vampires appear, who don’t share the vegetarian lifestyle of the Cullen’s. They catch Bella’s scent, and a vampire named James (Cam Gigandet), nearly attacks her. The Cullens protect her, but Edward has read James’ mind, and knows that Bella will always be hunted while James lives. They agree to take Bella somewhere safe, her hometown. Alice and Jasper takes her there, because they know James will expect her to stay with Edward, and splitting them up is a good idea. James lures Bella into a trap by making her believe that her mother is in danger. She escapes from her wardens, and heads to a ballet studio where she danced as a child. James bites her, infecting her with vampire blood, and after Edward and his family kills James, Edward saves Bella by sucking out the venom, keeping her human. In the hospital afterwards, Edward tells Bella that she will be safer with her mother, away from him. She panics, and he promises that he will never leave her as long as it is within her best interests. At prom, in which Bella was tricked into going by Edward, they reach an impasse. Edward is adamant that Bella should be human, and she wants to turn because that is the only way to be with him forever. The movie ends showing Victoria, James’ mate, spying on the happy couple. Twilight, the first of five installments (the fourth book was split into two movies), doesn’t seem as well produced as all the rest. It is enjoyable, scary and entertaining, and if you have a romantic heart you will enjoy the tale. I loved the scenery. It is a beautiful part of Washington. The school and other areas were pretty well reproduced, and all the characters have some of that small town charm. Bella Swan lost her position as the least liked character in the Feminist League only when Anastasia Steele came along. I personally don’t find her all that offensive. She is simply an insecure teenage girl. Kristen Stewart was well made for her portrayal of Ms. Swan. Her acting isn’t bad – it is just in real life where she has zero facial expressions. Edward Cullen is so much a McDreamy. Robert Pattinson did well there, and if his acting seems forced in Twilight, it improves slightly in the other movies. Funnily enough, it is his facial expressions in some scenes that trouble me – he looks a bit constipated at times. As a character, he seems moody and controlling, but also truly in love and protective. Taylor Lautner is seriously adorable as Jacob Black. All that long hair gave me such envy. He has a sweet puppy dog disposition in the first movie and novel, which Taylor did really well in. Kellan Lutz fulfills the bodily requirements of Emmet Cullen, and even some of his charm. But I just want to give the guy a few acting lessons as present for his birthday. He should stick to modelling Calvin Klein underwear – he excels in it. All in all, the main characters were well cast. Esme’s hair changed a lot between movies (will dye stick to a vampire’s hair?) and that bugged me. She looked exceptionally well with the golden brown. Peter Facinelli was a good Dr. Cullen. He did the vampire doctor to a T. He really does manage to look like a very compassionate man. Ashley Greene as Alice was also, once again, well done. She is certainly petite enough to be Alice Cullen, and she gave the performance the appropriate weirdness that is part of Alice’s charm. Jackson Rathbone is good as Jasper – he looks in pain, as he should. He also has the looks of a glamorous movie star – like in the book. I think a special mention needs to be given to Nikki Reed. She works hard every time in a movie, and does so well, and I see so little of her in other stuff. Am I being stupid and she is actually frequently cast? As Rosalie, she pulls the bitchface off so well. I love Rosalie’s animosity towards Bella – it would be so silly if all the people in Forks loved her immediately. How much changed between book and movie? There were a few changes, especially in the sequence of events, but since it suited the movie, I found I didn’t mind that much. The movie is as enjoyable as the book. It is sometimes surprisingly eerie, successfully scary and it is really a love story about two people who managed to be together no matter what got in their way.